Few gems have the mystique of jade, a stone that has been revered in China for more than 4000 years. Jade is also one of the most misunderstood of gems -- there is widespread confusion about the types of jade, about the most valuable colors, and the standards used to grade it. The most common confusion is about the meaning of the term jade itself. There is, strictly speaking, no such thing as jade. Rather there are two different kinds of jade -- jadeite and nephrite. They differ in chemical composition and crystal structure, as well as hardness. For more information on the differences, see our article on Jadeite and Nephrite. All of the jade mined in China is nephrite. Indeed until about 300 years ago the vast majority of Chinese jade was nephrite. Jadeite is the rarer and more valuable variety, and the chief deposits are in Burma (Myanmar), not in China. 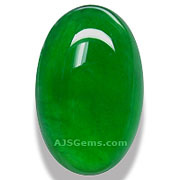 Nephrite occurs mainly in white and gray, with variants in dark green, reddish brown and black. The most common nephrite color is white. Jadeite occurs in a wider range of colors, including green, lavender, yellow, black and white. The most common color for jadeite is a pale green. However, the most valuable jade is the emerald green imperial jade, a rare translucent to semi-transparent jadeite containing chromium. Imperial jade comes mainly from the Hpakan-Tawmaw jade tract in Kachin province in northern Burma. Only the highest grade jadeite with an even bright green color and a high degree of translucency is given the designation "imperial jade." No treatment is observed. May be polished with colorless wax. Type A jadeite is completely natural and is the most valuable and rarest type of jade. Jadeite which has been bleached and impregnanted with polymers. The bleaching improves the color by reducing brown hues. The impregnantion with polymers is done to strengthen the jade and improve clarity and transparency. Jadeite which has been dyed to improve the color or the color consistency. This jade is usually heated to aid in absorption of the dye. Jadeite which has undergone bleaching, impregnation with polymers and dyeing. Since jadeite treatments are very common, it is important that jadeite by certified by a gemological laboratory with expertise in jade. We have our jadeite tested by The Gem and Jewelry Institute of Thailand (GIT), one of the leading research laboratories in the world for jade.